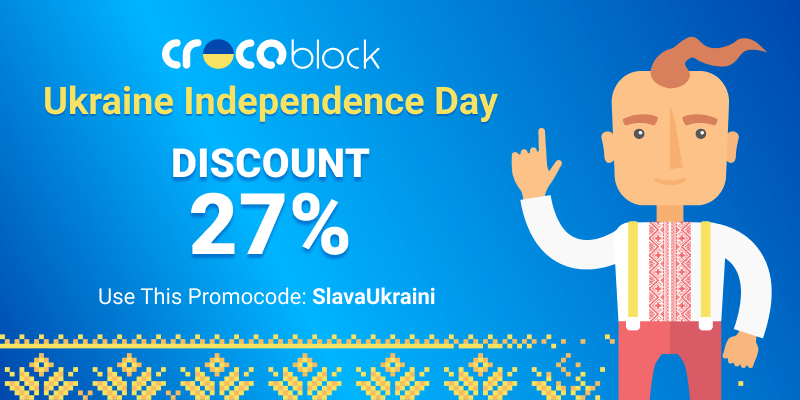 CrocoBlock subscription service was born in Ukraine, so it’s natural that we celebrate Ukraine Independence Day and want to offer a very special discount for everyone who wants to celebrate it with our team! Ukraine is a large country located in Eastern Europe, and this year we celebrate its 27th Independence Day. Actually, this is the reason we’ve decided to provide 27% discount for any pricing plan using the promocode “SlavaUkraini”. “Slava Ukraini”, by the way, means “glory to Ukraine”, and it is a commonly used greeting in Ukraine, that shows that we love Ukraine and wish our country to prosper in the future! Ukraine’s history is filled with constant struggle for independence, our ancestors fought hard to get it, and 24th of August is the date that is honored by every Ukrainian! CrocoBlock team is genuinely proud to be living and working in Ukraine, we honor our country’s traditions and history. Use the promocode “SlavaUkraini” to join the celebration, and don’t forget to greet CrocoBlock team with this great holiday!